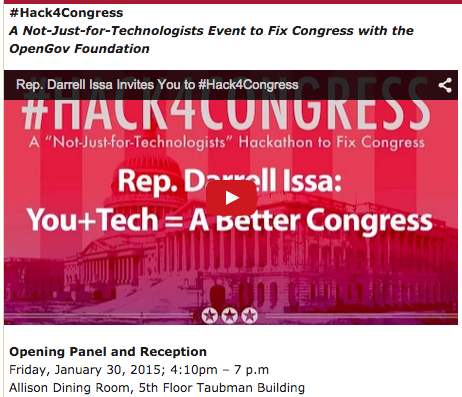 Today, I’m excited to be heading up to Harvard University to be one of ten judges at the inaugural Hack 4 Congress event – “A Not-Just-for-Technologists Event to Fix Congress, with the OpenGov Foundation”. Shout-outs to my fellow judges and the five challenges in play, to help make our troubled U.S. Congress (76% disapproval rate most recently, per Gallup) more responsive. 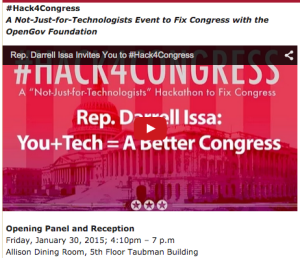 It’s especially welcome this event is open to less-traditionally-technical reformers – if you have an idea about how you’d like Congress to be more accountable, you can spec out a website or app. 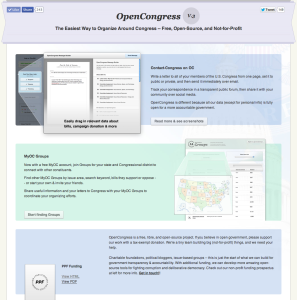 When my friends and I conceived of OpenCongress in 2004 and developed it in 2006, we were looking for a clearer view on which bills in the haystack really mattered and the key points of leverage around them (committee assignments, donations to party leadership, etc.). Here’s to hoping a similar popular resource is developed this weekend at the Kennedy School Ash Center. To bring in a somewhat-distant comparison, recent lauded products like Slack for team communications keep proving that a beautiful user interface and a few key unique features can launch an app into heavy use – I still believe that powerful tools for participatory democracy with Congress can be created, that we’ve barely scratched the surface of building free & open tools for engagement. So even after eight years of butting up against the insistently closed-off federal legislature, through the big bank bailouts and premature death of the public option and the unbelievable SOPA / PIPA battle, I still believe breakthroughs are possible with new tools & better design & sharper summaries. I’m so proud of the work that my small team and I did from 2006 to 2013 on OpenCongress, at which point we agreed to have the Sunlight Foundation acquire the site in full and maintain it as a free public resource. Excited to see where their team takes it with their new phase of intensive user research. In 2009, developing the first open-source code for users to link to individual sections of official bill text and comment on them on OC – basic features now carried much farther (w/ annotation & collaborative drafting for multiple uses & more) by the awesome myMadison platform from OpenGovFound and others. Publishing a daily OC Blog, with explicit coverage of the systemic corruption of Congress by campaign contributions – how effective public policy is twisted by corporate donors & PACs, blocks to fundamental electoral reforms, a lack of basic ethics regulation, continual under-investment in Congressional research infrastructure, and the “revolving door” for former staffers to K Street lobbying firms, Wall Street, Big Pharma, the military-industrial complex and others. Here’s a sample post by Donny Shaw from 2011, chosen pretty much at random, on why Congress delegated deficit reduction to a “supercommittee”, one that’s structurally incentivized against raising revenues by increasing taxes on corporations and the wealthy. We believe that clear context is necessary to understanding the Congressional-leadership-tea-leaf-reading news from the Beltway, and will help spur comprehensive electoral reforms – as informed by the pioneering democracy-reform work of our Board member, Prof. Zephyr Teachout and the new group Every Voice. 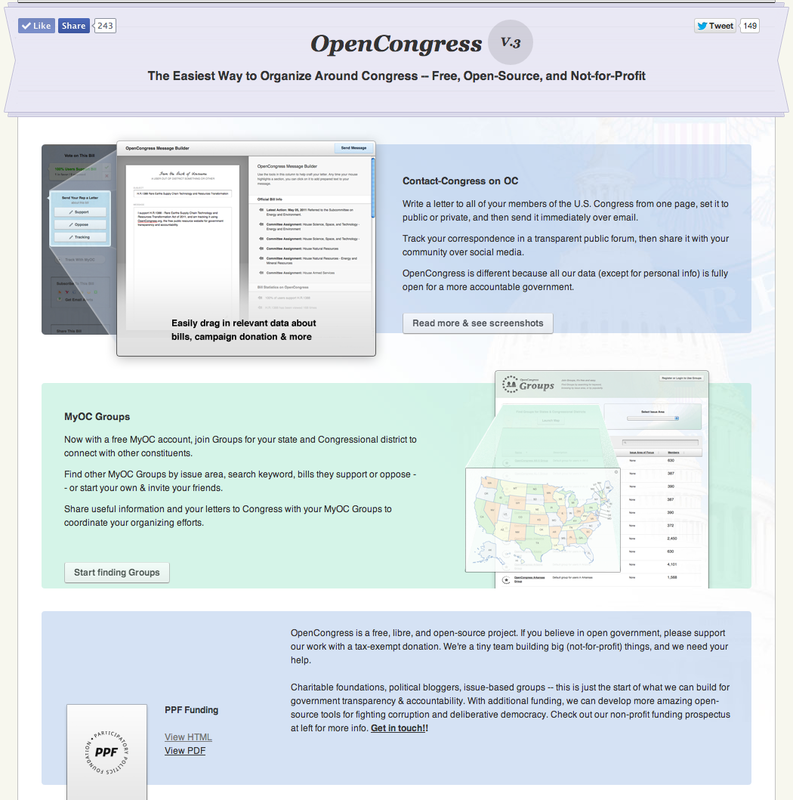 In 2011, launching OCv3: the Contact-Congress Message Builder interface, the first free & open-source tool for automated delivery of individually-composed messages through to Congressional webforms – first powered by PPF’s Formaggedon plugin by PPF’s Andy Ross, now an open-data community project. Original plain-language summaries of dozens of hot bills every Congress, free peer-to-peer organizing groups for all 435 U.S. Congressional districts, and much more. On the Hack4Congress Challenges & Project Ideas, will be very interesting to see what participants come up with – but in the mix, I’m especially interested in advancing campaign finance reform (such as the Fair Elections Now Act) and stronger ethics regulations. Good evergreen question topics for PPF’s current project, AskThem, as well.